Very pretty! Love the colors and the bg is really nice! Great job! Nice colors. The background looks good. Pretty roses. Love the scan. Matches well with the background! I like the dragonfly there. Well great job! wow! very very nice! I cant even tell that those pillars are crooked~ such nice roses too..it looks like stained glass. 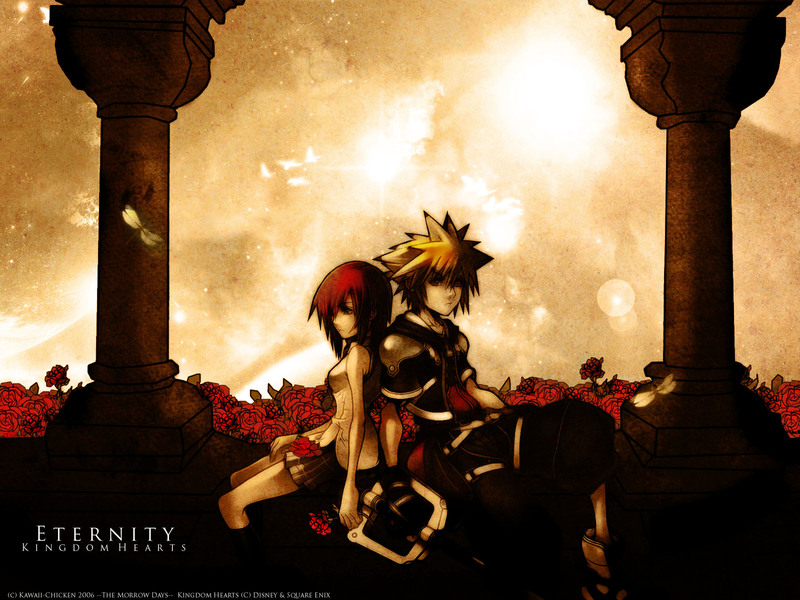 Wow, another awesome Kingdom Hearts wallpaper, love the colors and the background, really great, this one is going to my favorites. Beautifull, those roses in the bg are amazing, and the whole brown theme is too!, sora and kairi are both cool and I loved how you worked with this! I really like it. The roses are a really nice touch, and they complete the wallpaper. Great job.